I was hoping to do an entry sooner. I how have several pictures to upload. One is of a bill that I had to turn in to be retired. I don’t know what the bank does with it. It’s possible that they send it in based on my request, but I doubt that’s enough. I’d think that the bill has been worn out enough that they would send it in. Even then, what happens to it? Is it sent to some special location where someone makes a final decision? Granted, bills are relatively cheap to print, but given the number of bills out there, I don’t think that the government wants to be paying to have just any bill replaced. Is there a minimum amount of wear and tear? I’ll have to look into that. I also found two interesting bills. One is a ten that was marked with some sort of stamp. It’s in Spanish and I can’t make out enough of it to put into any sort of translation software. As you can see from the picture, there’s one stamp that’s pretty clear and another big one that’s sort of clear. There’s also a third one on Hamilton’s hear that looks like “OO” or something. There’s nothing on the back that would give me any clues. 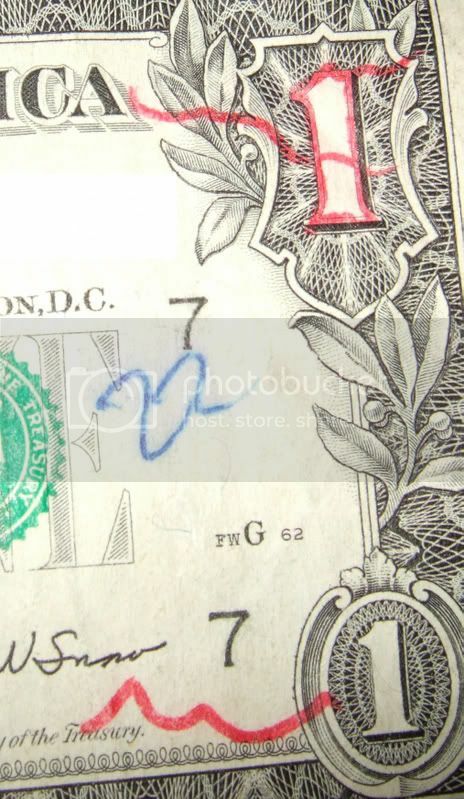 The other bill is a single with an outline made from a red marker. I think that in this case, someone just got bored and had a red marker handy. I have to wonder how many bills there are out there that fall victim to such boredom. I’ve seen a few more elaborate, similarly marked bills. In one case, someone actually refused it as payment because the person actually covered a great deal of the bill. 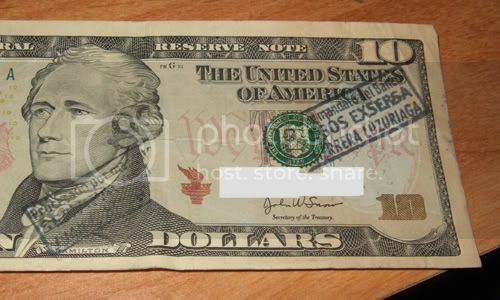 He had most of the upper right corner of the front of the bill decorated with a black magic marker. In other news, I got some pins in the map that I have for Where’s George. The first state that I did was Florida, simply because that’s where I had the most cities. It wasn’t easy to find most of them. I knew many of the cities just because I live near them. I had to use MapQuest to find most, though. This meant that I had to find the city or ZIP code, copy it into MapQuest and then try my best to find or approximate the location. I didn’t bother with a few of the cities that I couldn’t find simply because they were so close to cities that I already had. 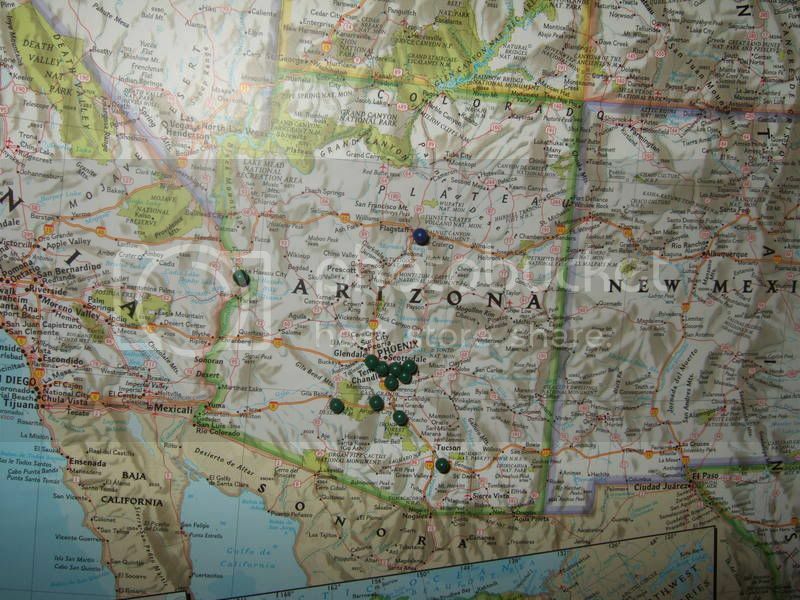 Next came New York and Arizona, which ranked second and third in terms of number of cities. Those were a little easier, only because there weren’t so many hits in each and the cities tend to be more spread out. The remaining states shouldn’t be that hard. It looks like I have no more than six cities per state, which should allow me to break it up more. I almost gave up with Florida because I had 80 cities and I didn’t want to break it up over two sessions. It makes it hard when you get a new city and you don’t know whether to do it now or wait. If you get several new cities, it can be confusing. In any event, I should have more to post soon. Whether or not I’ll get around to it is another question.